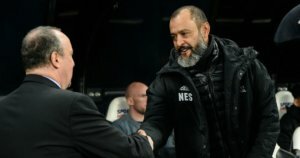 Newcastle lost 2-1 at home to Wolves when we played the newly promoted side on December 9th. In that game, it was a stoppage-time header from Matt Doherty beat a 10 man Newcastle. The winning goal was scored as Ayoze Perez seemed to have been fouled (elbowed) by Willie Boly in the Wolves penalty area but the referee simply waved play on. We haven’t had much help from referees this season. DeAndre Yedlin had been sent off after 52 minutes for what is termed a professional foul and that didn’t help our cause. Rafa thought at the time it was a really harsh sending off and was livid at the end of the game. After both Cardiff and Burnley won their games yesterday they jumped above Newcastle in the league. We are now in 17th position and the squad flies off to Murcia, Spain immediately after the match. Chelsea came out had a real good go at man city,24 mins later they are 4 nowt down….guess rafa’s contain and defend tactics not looking to bad right about now?? Money’s overrated. I’ve been with my partner over 24 years and we both love each other as much now as we did when we fist met. I’m a good deal older than her and they said it wouldn’t last blah blah blah. You’ll never find a happier couple, despite all my problems. We’ve always been there for each other and never – seriously, never – had a blazing row in all those years. – (Might be because I don’t drink). I would literally die for her if necessary. And we get by on my disability money which ain’t a great amount, believe me. I wouldn’t swap what we’ve got for all the money in the world. And that’s not BS either. Everybody who knows us would tell you that. Money can’t buy happiness. I imagine it can make being unhappy a lot easier, but I’ve had lots of money in the past and I know what I’d rather have. What we’ve got is priceless thank you very much and despite all my physical issues, this is the happiest I’ve ever been in my life. Love the post about you and your partner mate, you clearly really love her and that put a wee smile on my face even though we don’t know each other. C Dog, the English aren’t known for modesty eh? As for greatest team in the North, Ireland are the current holders. We won the last 6 nations and beat the all blacks, unlike your lot. Incidentally you have more players than any other country, a far greater pool than us. Learn some modesty and get over your superiority complex eh? Like you, I have my medical issues just back, a few hours ago, from NTGH to have an untrasound injection to my left hip fingers crossed it relieves the pain! Like you I’m also blessed with a wonderful wife – we will have been married for 50 years in September this year so that’s a milestone to celebrate eh? It would be also good to celebrate the continued membership of Newcastle United in the Premier League and the retention of Rafa as our Manager for next season & beyound. The icing on our cake would be to confirm that we have, at long last, a new owner of Newcastle United – here’s hoping eh? HTF did we beat Man City, but we did, we are in the thick of this relegation carry on, again, tomorrow’s game is humongous. Might as well bring up the statue of Oliver Cromwell inside the grounds of Westminster. How do you like them apples? we go above Brighton !!!!! Anyway, we’ll beat wolves and breath again. They owe us a couple points from the first game. Cdog for someone who says he is not anti Irish you do love drumming up the past but if your proud of the way your people raped and murdered, in a land that was not there says more about you as a person don’t it chap. I think we will beat wolves tommorrow going for 2 nil to us rondon at the double. I really really want to know how much profit Ashley has made from selling the land at Strawberry place that stops Newcastle United from developing the ground any further . This one act alone by Ashley has me seething . I detest him . A profiteering greedy swine . Newcastle City council had better have some answers as to why there was no public enquiry into land that was and should be classed as amenity and for the people. Has he not got enough money ? Starving the club of funds , running the football side on fumes . Making multi millions and trousering massive profits by selling the one bit of land that we could have extended the Gallowgate stand on ! I’m afraid the clientele on any home match day has changed for the worst ..thousands going along for the jolly up and to hell with protests . Protest, stay away ? Laughable now . It’s the people who still go under this Ashley regime that are doing the damage . Nothing wrong with suspending your support and keeping the love . Nothing to do with him and gate money ..it’s the national shame we would bestow on him if the ground was empty. Bestow….naa, humiliate with is apt. Are you defending Ashley in the sale of the Strawberry place land ? That land is more than a useless bit of tarmac as someone stated ..in fact it’s worth multi millions as has been proven. Useless bit of tarmac you say ? I’m going all out and down official channels this week to find out who has profited by this land deal and by how much . Strange how Charnley was banging on about the clubs worth to the community and economy and then the land sale by Ashley is announced by the Chron via Ashleys minions. How much has Ashley profited from land that belonged to the club and in turn the people who support the club ? Has he just made a deposit of multi millions into his personal bank account ? Ledge let the fool espouse about Cromwellian genocide all he wants. I’m sure his more intelligent fellow countrymen are wincing at his arrogance and stupidity. It was a different time. Let bygones be bygones. We gave you home rule eventually. Can’t see us winning tomorrow night, not the way we play. I’m afraid I tried twice but no luck… I have been blessed with 3 fine sons.. 7perfect grandchildren and a great grandchild on the way.. Phew. It’s possible that Ashley has just trousered millions out of Newcastle United in a final act of taking the Piss out of the Supporters before leaving ..if it’s that then the land deal should be deemed null and void. He could be doing a cut and run. That’s the Chelsea Manager sacked in the morning . He’s lost the players methinks. C dog you also gave us venebles, west , shipman you proud of that aswell? Cdog no anger here chap we are in different times now chap but every now and then people like you pop up to remind us of the past . So Ashley wasn’t prepared to pay the asking price. Is this why Kenyon’s deal hasn’t happened ? Has Ashley baulked at being refuted by so done not prepared to pat the asking price.